epexegesis: Two disciples, one boat, no "where"
Two disciples, one boat, no "where"
As noted in a previous post, Matthew 8:18-22 is the first narrative interlude sandwiched between the surrounding ten miracles of chapters 8 & 9. In this brief interlude we find Jesus getting ready to get on a boat and travel to the other side of the Sea of Galilee to go preach the gospel of the Kingdom of God. 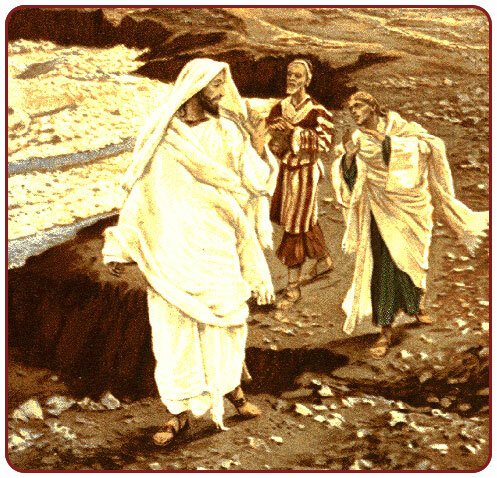 But before Jesus gets on the boat, he is confronted by two of his disciples. A scribe came up and said to him, "Teacher, I will follow you wherever you go." And Jesus said to him, "Foxes have holes, and birds of the air have nests, but the Son of Man has nowhere to lay his head." Another of the disciples said to him, "Lord, let me first go bury my father." And Jesus said to him, "Follow me, and leave the dead to bury their own dead." This is a great example of quick, clear-cut, straight forward narration. The first disciple speaks his mind and Jesus responds with one sentence. A second disciple speaks his mind and Jesus responds again with only one sentence. Then, in the very next verse, Jesus gets on the boat and sails to the other side of the Sea. This interlude is not part of the three miracles which occurred immediately beforehand, nor is it an essential part of the following three miracles. It just connects the two groups of miracles, and it leaves the reader with a lingering aftertaste of how serious the calling of discipleship was in the Lord's eyes. In the immediate story preceding this narrative interlude, we find group of three miracles in which Jesus is approached by a believing leper and a believing Gentile Centurion; and they both address Jesus directly as "Lord," which, for all practical purposes, illustrates their actual faith that Jesus was the Lord. The leper says, "Lord, if you will it to be so, you can make me clean." The Centurion even addresses Jesus twice as "Lord." But here in this narrative interlude, Matthew goes out of his way to describe the first disciple as one who doesn't care to address Jesus as "Lord." In fact, Matthew doesn't even describe him as a disciple. Instead Matthew describes him according to his profession, a "scribe." And instead of illustrating his faith in Jesus as Lord, he addresses Jesus as his "Teacher." So far, the picture which Matthew has painted doesn't look too pretty. But it actually gets uglier. If the scribe would have addressed Jesus as "Lord," we probably wouldn't have noticed the fact that he was a scribe so much. But because this scribe addresses Jesus as "Teacher," the fact that he's a scribe stands out even more. It's as though this oh-so-humble scribe is placing himself in the position of an oh-so-humble student. Jesus is not so much the Lord in this man's eyes as he is a powerful, wonder-working teacher that this student can learn from and follow. Before Jesus reaches the boat, this scribe proclaims abruptly, "Teacher, I will follow you wherever you go!" And apparently this didn't flatter Jesus very much. One can almost sense what Jesus was thinking in response. But Matthew doesn't record everything that he was thinking. Instead, all we are given is a glimpse of what Jesus was thinking and what mattered most to him. In Jesus' response we find a word that he intentionally picked up on and emphasized in his response to this self-proclaimed "student" of his. The scribe said he was willing to follow Jesus "wherever." That single word is actually comprised of two words in the original Greek, ὅπου ἐὰν ("where" and "ever") and Jesus responds by saying that he has no "where" (οὐκ που) to rest his head. If this self-proclaimed student is really willing to follow his Teacher every "where," he needs to realize first that there actually is no "where" to rest if Jesus has no "where" to rest either. And it's only reasonable that a teacher would let his student know this in advance. After all, that's what a Rabbi expected from his most devoted student. The student followed him. After a Rabbi left his home in the morning, the devoted student was nearby to serve him; and when the Rabbi rested, the student had some time to go home and rest as well. But not so with Rabbi Jesus. "The harvest is plentiful, but the laborers are few," as Jesus will be saying a few paragraphs later. And because the laborers are few, and Jesus is on a mission to fulfill the work which his father has given him, there will be no rest until his work on earth is finished. After Jesus proclaims the coming kingdom and accomplishes redemption, he enters into his sabbath rest. In the mean time, there is too much work to do in the kingdom. This is when the second disciple enters the story. And as one might expect, the second disciple is set in contrast with the first one. If the first disciple is portrayed as one who exaggerates and embellishes his commitment to discipleship, the second disciple is portrayed as one who isn't committed enough. But there is at least hope for the second disciple. The first disciple is rejected by Jesus. But with the second disciple, Jesus responds by saying "follow me." I am fully aware that throughout the various hard-hitting, repentance-calling, sin-exposing, emotionalistic preaching of modern Christendom, this second disciple is often portrayed as an un-believer or at best a half-hearted Christian. Preachers mooch off this passage as though this disciple wasn't willing to place Jesus as numero uno in his life, and therefore the ending of his life must have become a sad sob-story of regret and sin-saturated shame. Sad, sad face. But I don't actually think that was Matthew's point in this portion of the narrative. As far as we know, this second disciple really did not attend his father's funeral. For all we know, Jesus' words cut right to his heart and the second disciple followed Jesus onto the boat and to the other side of the Sea. We don't know, and no other synoptic gospel alludes to the contrary. If this second disciple is set in contrast with the first disciple -- the scribe who was rejected by Jesus -- then it's at least possible that this second disciple is an illustration of one who did count the cost and actually followed Jesus. Certainly there is the lesson of priorities to be gleaned from this narrative. The second disciple is concerned about burying his father "first." But an equally obvious lesson to be gleaned from this story is that those who actually commit to following Jesus "wherever" he goes, even though they won't have a place to rest, are actually gaining life. "Follow me," Jesus said, "and let those who are dead bury their own dead." In other words, Jesus is saying: "Where I am going, there is life." Jesus was already called by his Heavenly Father to go the other side of the Sea. That was the first thing mentioned in this narrative interlude, and it sets the tone for those characters in this narrative who actually hear Jesus' call to follow him. Let's keep in mind that Jesus was not speaking literally when he said he didn't have any place to rest his head. In fact, his response to the scribe was just as exaggerated and non-literal as the scribe's promise to him. And for those who wish to argue otherwise in order to extract some "eternal truths" that sound good to audiences enthused by emotionalism, it is in the very next story -- only two verses later -- that we find Jesus in a deep sleep on a boat! And so, we know from this that his response to the scribe was never intended to teach us an eternal truth about his sleeping habits. Rather, Jesus was simply testing his willingness to commit as a disciple. Likewise, the response of Jesus to the second disciple about skipping his dad's funeral first was never intended to be a paradigm for all circumstances in life. In other words, we ought not to extract "eternal truths" about following Jesus which were never conveyed by the actual narrative. Sensationalized preaching is loaded with "eternal truths" that actually are not taught in God's Word. And this is but one of those examples. Matthew is not teaching that Jesus needs to be first before we brush our teeth, first before we turn on the radio, and first before we squirt ketchup on our hot dog at lunchtime. Jesus is supposed to be first in everything we do, not before everything we do. He is ultimate in authority, which makes him ultimate in every priority. And this principle is illustrated no differently with this second disciple. The imagery of what Matthew wrote is very clear. Jesus was on his way to the other side of the Sea. He needed to get on a boat to do that. He wasn't going to wait around another day or two for a dead man's funeral to finish. There was work in the Kingdom that needed to be done on the other side of the Sea. And so, in this very real historical setting, Jesus is not rejecting the second disciple. He's actually giving him a chance that he didn't give to the first disciple. Jesus says "Follow me" to this second disciple, and we, like him, are supposed to place ourselves in his shoes and make a decision in our own life. Do we cross the Sea with Jesus and preach the Kingdom along with him, or do we follow the traditions of men and go home to bury our father? Will we go where Jesus has promised life, or will we go where Jesus has promised death?